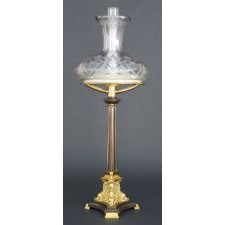 Impressed MESSENGER on the cast iron base weight, this smaller and nicely proportioned sinumbra has a fluted and reeded standard which terminates in a three-sided base. Three dophins with tritons centered between them support the standard. Beautifully prepared in a patinated and gilt-lacquered finish, the lamp is topped with a very fine frosted and cut glass shade with lyres.